The AdQ Study is a mostly quantitative ad readership and effectiveness study designed to provide B2B and B2C publishers with ad readership, editorial, and reader profile information. This information is usable for both sales purposes and editorial guidance. Our surveys are customized to fit the needs of the publication through consultation with experienced staff. AdQ uniquely measures the effectiveness of advertising among those with buying involvement – the advertiser’s target audience – and a key element in proving ROI to advertisers. Publisher’s Report, Verbatim Report, Advertiser Report – AdQ provides you with three separate reports to give publishers greater control over the information publishers choose to share publicly or keep for internal analysis. The AdQ Study answers the most important question, “Is my advertising investment paying off (ROI)?” For over 40 years, AdQ has been the measure of success in advertising effectiveness. As the publishing industry has evolved in the digital age, AdQ has as well. AdQ offers a variety of methodologies, content levels and results formats. 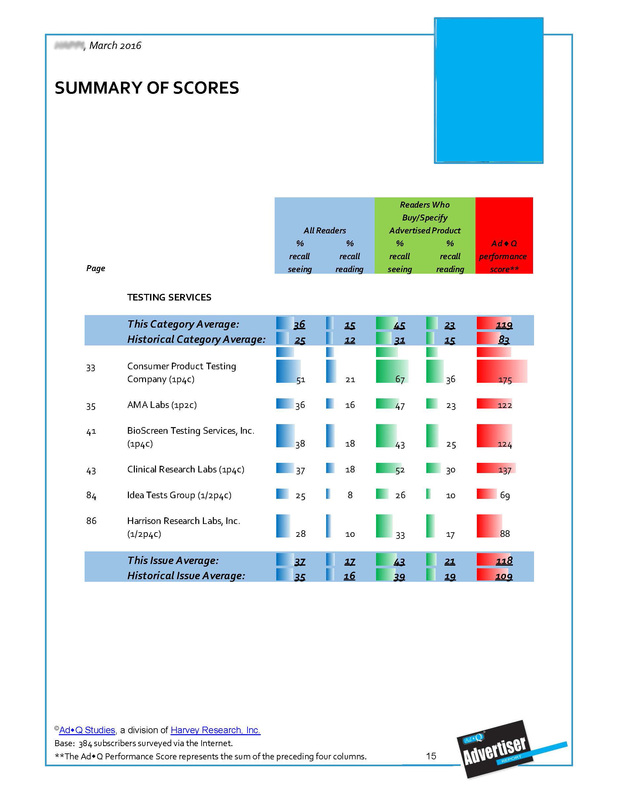 Our reports have been fully redesigned to be more graphic and turnkey for publishers. Our reporting flexibility gives publishers greater control over how they share information and with whom, making it a more effective sales tool. Our large database of normative information helps put your results into proper perspective. And, we provide salesteam training at no additional cost at the conclusion of your study. The Advertiser Report documents each studied advertiser with seeing and reading scores for all survey respondents, as well as seeing and reading scores for those with buying involvement the advertisement is categorized under. Only AdQ uniquely makes the distinction between readers and buyers who are readers. Advertisers can compare their score against others in the issue and learn how page size, color and location impact readership. 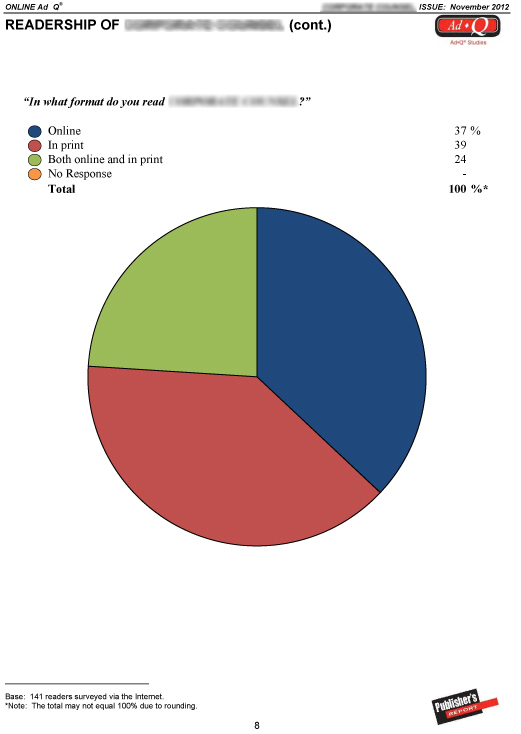 The Publisher’s Report is an independent analysis of readers’ job functions, responsibilities, business activities, buying involvement, readership of the publication and the buying actions stimulated by the publication. 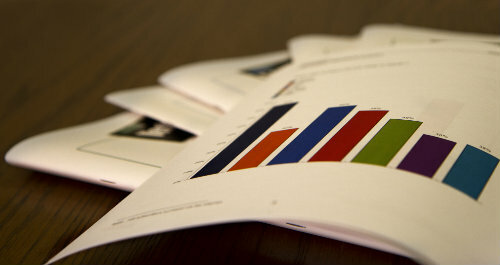 The Publisher’s Report allows you to monitor reader traffic and editorial viability. It can be retained as a confidential management document or shared with advertisers at the discretion of the publisher to independently illustrate how the circulation matches the advertiser’s target audience. As an additional service of AdQ Studies, readers are given an opportunity to comment on advertisements and articles in the issue. 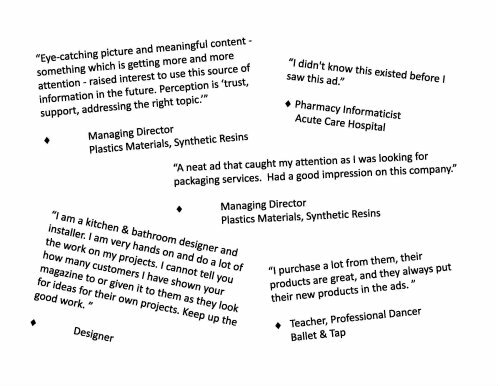 Their unedited responses can provide useful insights as to the effects of individual ads, the campaign as a whole, and the usefulness of the publication.